Clive Rowlands OBE gained fourteen caps for Wales, all of which were undertaken as the Welsh captain. He made his debut in the 1963 loss to England in the Five Nations Championship. He led Wales to a Triple Crown in 1965. 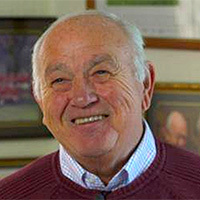 After retiring as a player, Clive was coach of the Welsh national team for 29 matches between 1968 and 1974, becoming the youngest person to hold this position. This was a successful period for Wales, including a Grand Slam in 1971 and included the tour of New Zealand in 1969. He was manager of the British and Irish Lions tour to Australia in 1989, managed the British Isles team versus a rest-of-the-world team in 1986, and also managed Wales in the 1987 Rugby World Cup. He was President of the Welsh Rugby Union in 1989. This entry was posted on Friday, August 3rd, 2018 at 6:22 pm	and is filed under 2021 Festival, News.